Well no sooner had I published yesterday’s post when I received an email from friend and blog reader Bill. He informed me the photo was of the Aladdin Tower in Greenford. I did some checking and he is correct (as usual). 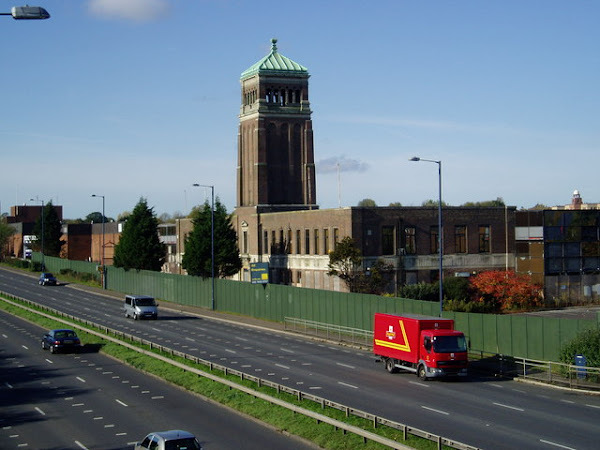 Then blog reader Davidss left a comment suggesting it was probably a water tower. So what information have I found. The tower is part of the old Aladdin Factory built in 1931. Aladdin manufactured paraffin heaters and associated components (eg, wicks) at the factory. It was closed in 1980 and is now a Dunelm Mill. Apparently there was also a B&Q store on the site at one time. An almost rural setting back in 1937 and then it changed to light industry. Now the building is surrounded by residential housing. Another interesting fact. During WW2 Aladdin Industries developed a number of barometric fuses which were used by the RAF. These fuses were manufactured at this factory. <link to the Imperial War Museum>. Aladdin Industries has a rather interesting history. The mantle lamp was first invented in Germany. Canada and America had large rural populations and as a consequence many German manufactured lamps were exported. However during WW1 German products became both unpopular and unavailable. The Americans then started making their own which over time became superior to the German models. The UK government had introduced substantial taxes on products not made locally to protect UK industries. 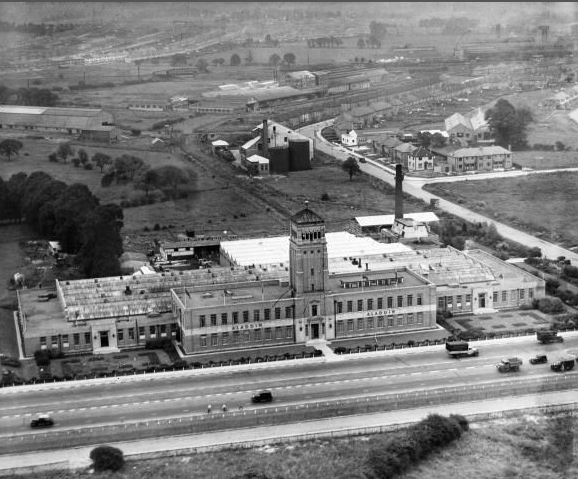 So Plume & Atwood (American manufacturers) established the Aladdin factory at Greenford in 1931. During WW2 brass became a restricted metal and Aladdin started making lamps from steel. They also diversified manufacturing other products using their burner technology. This included field kitchen stoves, refrigerators, coffee urns and dehumidifiers. They also started manufacturing thermos flasks. By 1963 America had ceased manufacturing lamps and was importing them from Aladdin UK. How the worm had turned. Aladdin Industries also had a manufacturing plant in Australia. The Australian factory also suffered from a lack of brass during WW2 and manufactured lamps from steel and glass. The steel was painted rather than galvanised. Of course the increasing availability of electricity steadily reduced the demand for paraffin lamps but the decision by the UK government to raise tariffs on imports to protect local industry allowed Aladdin to manufacture and supply ‘The Empire’. Ownership of Aladdin eventually reverted back to America and in 2015 it was sold to Lehmans. The company assets were then transferred from Tennessee to Dayton, Ohio. Apparently the tower and building now have protected status. Nice bit of history Tom, lovely picture from Britain from Above. If only we had a time machine!